7213 Off-Road Fire Truck is a City Fire set released in January 2010. 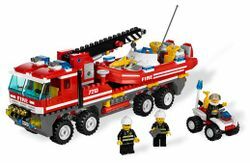 The set includes a fire truck with moveable boom, ATV, fire-fighting raft, and three Firemen. This is one of the first five sets to include the new exhaust pipe. At select Target Stores in the USA, this was released in early December 2009. In the United Kingdom this was exclusive to Argos stores. This is a description taken from LEGO.com. Please do not modify it. (visit this item's product page) Fight fires on land and sea! There’s a blaze in LEGO CITY harbor! Use the high-speed quad bike to spot the fire, then call in the big off-road fire truck. Use the built-in crane to unload the fireboat, and splash to the scene with its powerful twin motors. Another emergency beaten, thanks to the city fire-fighting team! Includes 3 minifigures with fire-fighting gear. Includes Fire Truck, Fireboat and 3 firefighter minifigures! Measures 10" (24cm) long, 2" (5cm) wide, over 3" (7cm) tall! 12160 Backpack and Pencil Case Set, LEGO City Police | 22085 2011 City Calendar | 66342 City Super Pack | 66345 City Super Pack | 66358 City Super Pack 3 in 1 | 66360 City Super Pack 4 in 1 | 66362 City Super Pack 4 in 1 | 66363 City Super Pack 4 in 1 | 66374 City Super Pack 4 in 1 | 852514 City Police Handcuffs | Calling All Cars! Facts about "7213 Off-Road Fire Truck & Fireboat"
Fight fires on land and sea! There’s a blaze in LEGO CITY harbor! Use the high-speed quad bike to spot the fire, then call in the big off-road fire truck. Use the built-in crane to unload the fireboat, and splash to the scene with its powerful twin motors. Another emergency beaten, thanks to the city fire-fighting team! Includes 3 minifigures with fire-fighting gear. 5cm) wide, over 3" (7cm) tall! This page was last edited on 28 April 2016, at 18:19.